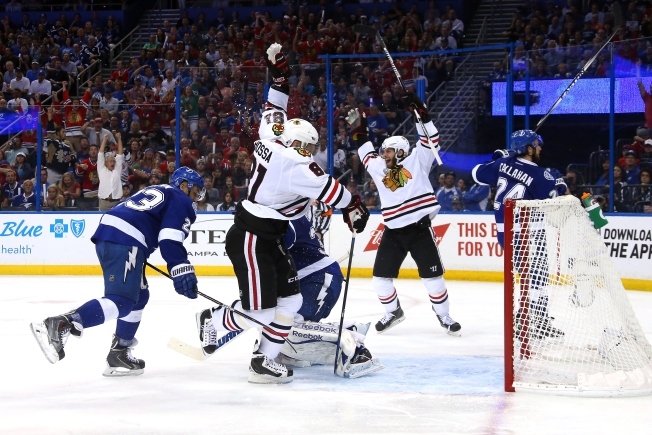 Marian Hossa (81) of the Chicago Blackhawks reacts to a third period goal by Brent Seabrook (7) against the Tampa Bay Lightning during Game 2 of the 2015 NHL Stanley Cup Final at Amalie Arena in Tampa, Florida. If you haven’t gotten your tickets into the United Center for Game 3 of the Stanley Cup Final on Monday, you may have to break open more than just one piggy bank. That’s because the average ticket price to get into the game is sitting at $1009, according to Danny Ecker of Crain’s Chicago Business and data from Seat Geek. Game 4 has an even higher price tag, with tickets costing nearly $1,200 on average. Those numbers both outpace the average ticket price on the resale site from the 2013 Stanley Cup Final against the Boston Bruins, according to Ecker’s report. Not dissuaded from trying to get tickets? The cheapest tickets remaining available for the game are checking in at $407 for standing room only tickets, according to Seat Geek. Bishop: "I Feel Like Marshawn Lynch Right Now"